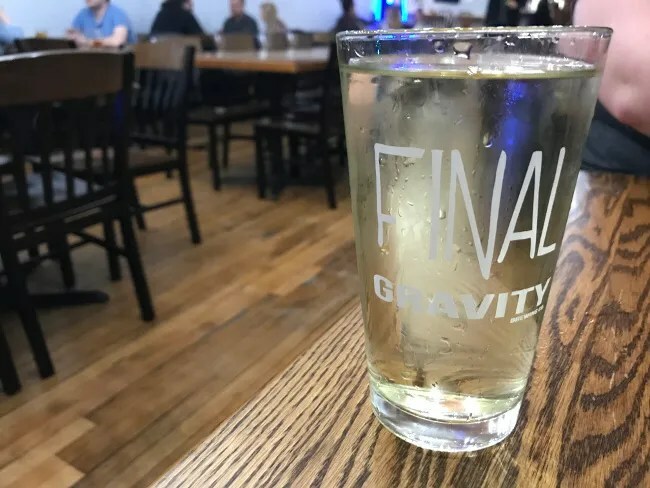 More beer is a good thing for Kalamazoo. 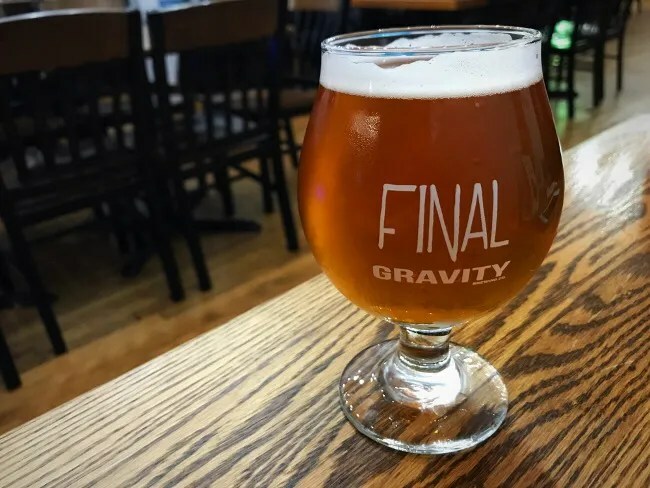 J and I love going to the great breweries we have in town and we were excited when we heard a Van Buren County brewery was going to open a location in downtown Kalamazoo. A few years back, J and I took a trip to Decatur for dinner. We had a babysitter and wanted to get to someplace we had never been before. 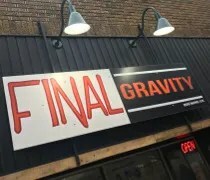 I found Final Gravity Brewing at the Bell’s Funvitational and really enjoyed the beers. At that time, their only taproom was in Decatur. That’s not the case anymore. 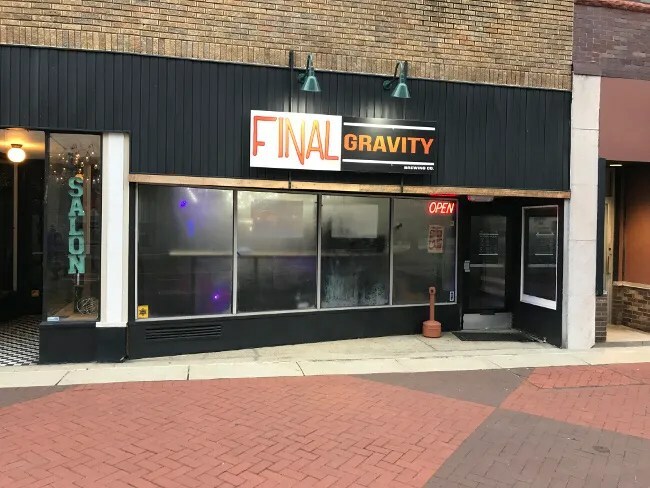 Final Gravity Brewing’s second location is in downtown Kalamazoo on the section of Burdick Street that is still closed off between Water and Eleanor Streets. The pub is closest to Eleanor Street which has plenty of nearby parking either on the street at meters or in nearby Ramp 4. The space used to be the Whole Art Theatre so it took a little work to turn the place into a brewery. There are great hardwood floors throughout the space with tables and solid wood chairs packed in to the space. 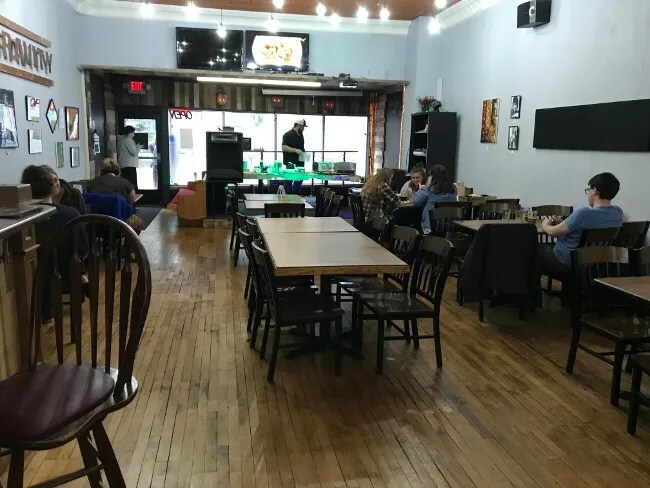 The walls are sparsely decorated brighten up the space which has a stage near the front door that works as both a catering set up location and a space for live music. The bar is in the back space. It’s built out of wood slats with basement bar style chairs. 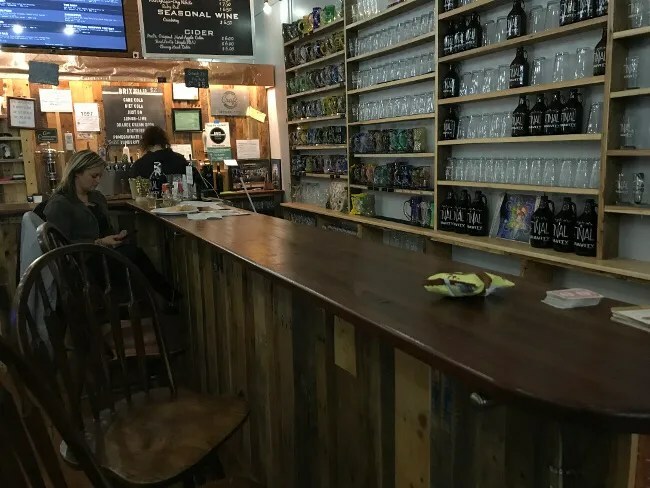 The walls behind the bar are filled with growlers and mugs from their mug club. Their list of beers are on a monitor over a stand up refrigerator of bar snacks. One thing this Final Gravity location doesn’t have right now is food but they bring in outside vendors on weekend nights to have something available. The night we were there it was Kelvin & Co. They were supposed to be start serving at 6:00, but when we walked in at 6:15, dinner service was still being set up. I headed to the bar to get us drinks. I got an InDecatur for my first round. I did a flight when we went to the Decatur location so it wasn’t as important for me to do it on this trip. I really wanted a big, hoppy IPA and that’s what I got with this DIPA. 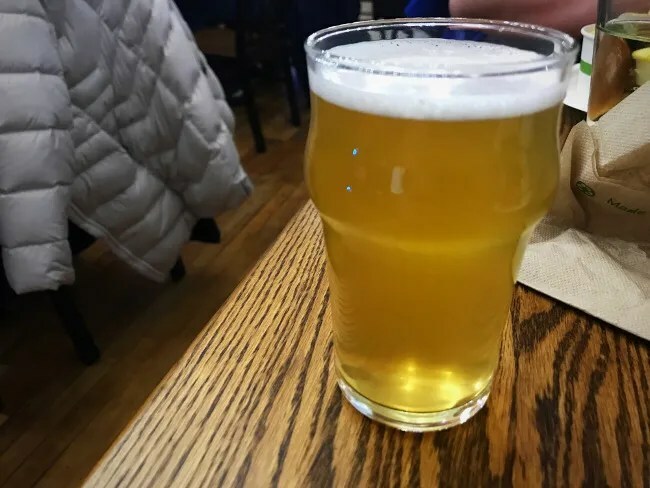 It had a lot of the characteristics of the new juicy line of IPA’s, but it was the hazy NE IPA that’s so popular in Michigan right now. It’s a tasty, sippable DIPA if you like the really hop forward beers……and I totally do. I went to order J a Final Pete’s…their Maple Barrel Aged Hard Cider…but they were out. I got the Pete’s Original Hard Apple Cider instead. It’s a pretty solid hard cider. It’s a more dry than sweet, but she had no complaints…but she was really looking forward to the barrel aged one when she saw it. We got each of the kids a lemonade pop. They have Brix Soda Co. drinks for the non-alcoholic crowd. L got an Orange Creme Soda and we got B a Pomegranate Lemonade. There were bags of chips on sale at the bar too and L wanted a bag so we got them as well. The total for this round with tip came out to $21. The hope at this point was that we could eat dinner, but at 6:45, the guy from Kelvin & Co. didn’t have any buns and couldn’t take credit cards….so we waited….and I got another drink. This time I ordered Smash 300 with Hop Hash which was their Nitro pull that night. This beer had a ton of flavor for a pale ale and the smoothness from the nitro pull added a lot to the overall mouthfeel and flavor of this beer. I wouldn’t drink more than one in a sitting but it was a perfect meal to go with the BBQ we eventually got. 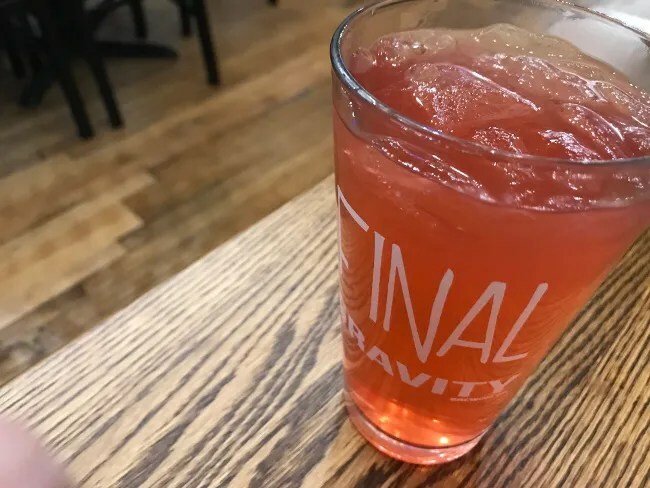 I hope someday Final Gravity is able to add a kitchen. Their beer is fantastic but we got frustrated with Kelvin & Co. not being ready when we got there after the scheduled time. We love Kelvin & Co. but this night was frustrating. We’re really looking forward to the new store out on West Main and this experience hasn’t changed that. I really like this spot downtown. It’s in an area where you still feel as if you’re in a city center but it’s secluded enough from the traffic that it still feels like your neighborhood bar.